The NIE publication Applied Creativity: A Directory of Arts & Cultural Experiences for Pre-K – 12 Students 2017-2018 has received a 2018 Gold Creative Excellence Award from the Florida Newspaper Advertising and Marketing Executives. Applied Creativity was created in partnership with the Arts Council of Hillsborough County. The Creative Excellence Awards were presented at the 2018 Florida Media Conference, Aug. 8-10, 2017 in Orlando, Fla. The NIE publication Reading with the Rays: Read your way to the ballpark 2017 has received a 2017 Creative Excellence Award from the Florida Newspaper Advertising and Marketing Executives. 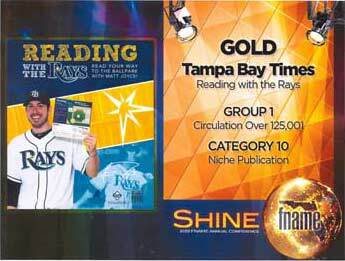 Reading with the Rays, created in partnership with the Tampa Bay Rays and the Suncoast Credit Union Foundation, was awarded a Bronze award. The awards were presented at FNAME’s annual conference Aug. 10-11, 2017 in Naples, Fla.
Three NIE publications have won awards in the 2017 National Newspaper Association Newspaper And Education Contest. Three NIE publications have received 2016 Creative Excellence Awards from the Florida Newspaper Advertising and Marketing Executives. From the Scrub to the Twist, created in partnership with the City of Tampa, Tampa Bay History Center and the Florida Humanities Council, was awarded both a Gold and a Silver award. ROBOTICON, created in partnership with the Eureka! Factory, was awarded a Silver award. Floridians and War, created in partnership with the Florida Humanities Council and the Armed Forces History Museum, was awarded a Bronze award. The awards were presented at FNAME’s annual conference Sept. 29-30, 2016 in Clearwater Beach. The Tampa Bay Times has been awarded a silver World Young Reader Prize award in the Enduring Excellence category by the World Association of Newspapers and News Publishers (WAN-IFRA) for its Enterprise Village Times program. The Enterprise Village Times is a newspaper that is created, printed and sold by students participating in Enterprise Village, the Gus A. Stavros Institute’s six-week economic education program for fifth-graders. The jury said: “This very sound project supports financial education, encourages teamwork and gives young people a taste of working life, while simultaneously ensuring that they see the newspaper as an integral part of society." The Tampa Bay Times Newspaper in Education publication La Florida – Land of Flowers: Ornamental Horticulture with Florida Native Plants received a 2016 Media Awards Silver Medal of Achievement, presented by GWA: The Association for Garden Communicators. This national award recognizes individuals and companies who achieve the highest levels of talent and professionalism in garden communications. The 2016 competition had more than 250 entries in 56 categories. Recipients of the Silver Medal represent the top 10 percent of each competition category and will now compete for best of group in the areas of writing, photography, electronic media, publishing and trade. The award will be presented at the GWA’s 68th Annual Conference & Expo September 16-19, 2016. La Florida was created in partnership with the Stanley Smith Horticultural Trust and the Florida Native Plant Society. Four NIE curriculum supplements have won awards in the National Newspaper Association 2016 Newspaper And Education Contest. Two NIE publications received 2015 Creative Excellence Awards from the Florida Newspaper Advertising and Marketing Executives. 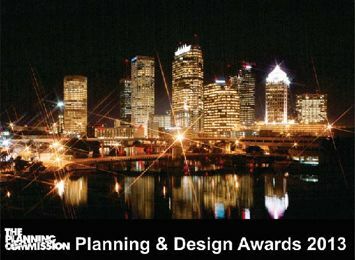 Lights on Tampa, created in partnership with the City of Tampa, received a Gold Award. Zoominations, created in partnership with Tampa’s Lowry Park Zoo, received a Silver Award. The awards were presented at FNAME’s annual conference in Sarasota, FL, October 1 – 3, 2015. Four NIE curriculum supplements have won awards in the National Newspaper Association’s 2015 Newspaper And Education Contest. Fit4Allkids, a family nutrition education and fitness program produced in partnership with All Children’s Hospital, has been awarded a 2014 World Young Reader Prize special mention award by the World Association of Newspapers and News Publishers (WAN-IFRA). Since 2009, All Children’s and NIE have collaborated to produce an annual Fit4Allkids curriculum supplement focused on fitness and nutrition. Each year targets a different age group and has a different editorial focus. The 2014 World Young Reader Prizes will be awarded at the 2014 World Young Reader Summit and Ideathon in November in Bali, Indonesia. 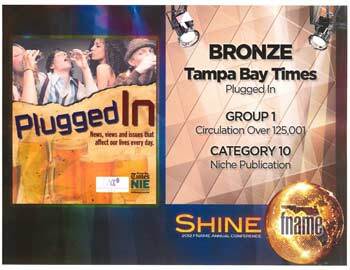 The NIE publication Coasters 101 was honored with a Bronze Creative Excellence Award by the Florida Newspaper Advertising and Marketing Executives. The award was presented at FNAME’s annual conference in Coral Gables, FL, Sept. 4-6 2014. The NIE publication LarGoing Green, created in partnership with the City of Largo, received a Savvy Awards Silver Circle Award from the City-County Communications & Marketing Association (3CMA). The award was announced at the Savvy Awards ceremony during 3CMA’s annual conference in Minneapolis on Sept. 4, 2014. Three NIE curriculum supplements have been recognized with national awards in the National Newspaper Association’s 2014 Newspaper And Education Contest. The NIE publication Dirt to Plate, created in partnership with All Children’s Hospital and Kohl’s Cooks for Kids, received an Honorable Mention in the category of Best Publication in PR Daily's Corporate Social Responsibility Awards 2013. 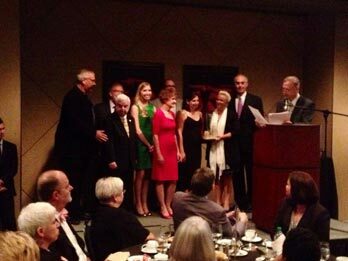 NIE development specialist Sue Bedry has been honored with a 2013 Award of Excellence by AIA Tampa Bay. The award was presented in recognition of the 2012 NIE publication Past Forward Tampa Bay, created in partnership with AIA Tampa Bay, the Florida Department of State, Division of Historical Resources and the Hillsborough County Board of County Commissioners. 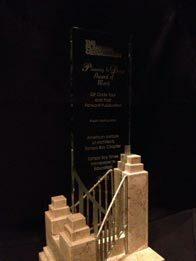 The Award of Excellence is awarded annually by AIA Tampa Bay to a layperson who has made a significant positive impact on the profession of architecture or the built environment. The award was presented at AIA Tampa Bay’s Celebrate Design 2013 reception on Thursday, November 7th, 2013 in Tampa. The NIE publication Past Forward Tampa Bay, created in partnership with the American Institute of Architects Tampa Bay, the Florida Department of State, Division of Historical Resources and the Hillsborough County Board of County Commissioners, was honored with an Award of Merit at the 31st Annual Planning & Design Awards presented by Tampa Electric on October 17, 2013. 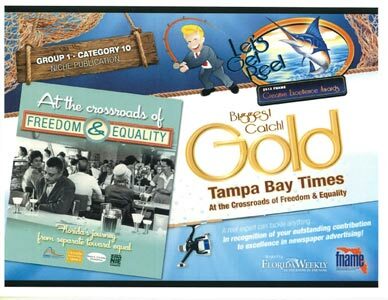 The NIE publication At the Crossroads of Freedom & Equality: Florida's Journey from Separate toward Equal was honored with a Gold Creative Excellence Award at the 2013 Florida Newspaper Advertising and Marketing Executives annual conference in Bonita Springs September 26 – 28, 2013. Reading with the Rays - Read Your Way to the Ballpark, a summer reading program produced in partnership with the Tampa Bay Rays and the Rays Baseball Foundation, has been awarded a 2013 Silver World Young Reader Prize by the World Association of Newspapers and News Publishers (WAN-IFRA). Two NIE curriculum supplements have been recognized with national awards in the National Newspaper Association’s 2013 Newspaper And Education Contest. Two NIE publications were honored with creative excellence awards at the 2012 FNAME (Florida Newspaper Advertising and Marketing Executives) annual conference in Tampa September 27-29, 2012. The conference is a gathering of newspapers from across the state, along with vendors, advertisers and industry experts. In conjunction with the conference, FNAME newspapers submit creative campaigns and collateral materials and compete against each other in 3 circulation groups. 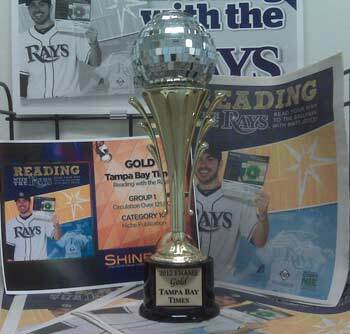 Reading with the Rays, a summer reading program produced in partnership with the Tampa Bay Rays and the Rays Foundation, was honored with a Gold Award for Creative Excellence. Plugged In, a publication created in partnership with DACCO, focused on drug abuse and addiction issues and geared toward college students and adults of all ages, was honored with a Bronze Award for Creative Excellence.